INTEGRATRON \ Designed by UFoligist George Van Tassel in the 1950's for time travel, anti-gravity and rejuvenation. This acoustically perfect white dome is hard to miss. Make a reservation for a crystal sound bath, if you're not the planning type, swing by if you know when they are having a session and chances are you can get on the unofficial wait list, there are usually no-shows. NOAH PURIFOY \ Noah Purifoy was an African-American visual artist and sculptor. His outdoor desert museum features giant structures of assemblage art. It's mostly in the sun so I don't recommend it at high noon during the summer. Sunset or late afternoon is best. WHITEWATER CANYON \ The drive to canyon is beautiful in itself. Park and stroll down to the year-round Whitewater River or go for a longer walk along one of the trails. Check their website for fire closures throughout the year. SAM'S FAMILY SPA \ On the way out to the desert dip in and dip out of here. Not for everyone! (Yes it's an RV "Resort") Find pools fed by natural hot springs sans chemicals, which is rare out here. Most places put chlorine in their springs like this but these guys drain and clean them daily so they don't have to. Plus the people watching is usually A+. There's an entry fee around $20 on the weekend and $8 during the week. INSTITUTE OF MENTALPHYSICS \ A self realization center, I pop by here for a walking meditation in the seven-circuit labyrinth. MOJAVE SANDS MOTEL \ A striking desert motel where design was spared no expense and you can even walk to the Joshua Tree Saloon. LA COPINE \ Not just the best restaurant in the area, but a dynamite stop for LA standards. It's brunch or lunch here, the close their doors at 3pm. Check their website as they close for a month in the heat of the summer (July/August). LAIR HOUSE \ Built by Kendrick Bangs Kellogg this is the most impressive architectural home you'll set your eye on for miles and miles..and miles. More about this gem here. Pappy + Harriets \ In 1946, a group of filmmakers built a Western-style movie set in the high desert. This honky tonk, BBQ restaurant was a cantina before it reopened and started serving Tex-Mex and playing live music that never disappoints. Check their website for hours and shows, you might be impressive with some of the bands than play here under the desert air. Reservation highly recommended! CACTUS MART \ If you're in the market for some cacti this is the place to pit stop on the way home. JOSHUA TREE NATIONAL PARK \ Obviously visit the park! You can drive through and stop along the way to get out and walk around at various stops (Skull Rock, the Cactus Garden and all that great stuff, turn to google for me) or come more prepared and choose one of the many trails to blaze. Bring water! It's also beautiful to visit for sunset and great for star gazing at night. THE LAUTNER COMPOUND \ Behold the The Lautner Compound. Beautifully designed as expected with kitchenettes and little outdoor spaces for lounging, reading, working. It's less like a hotel and more like a home away from home to come back to after a long hike in the park and relax. 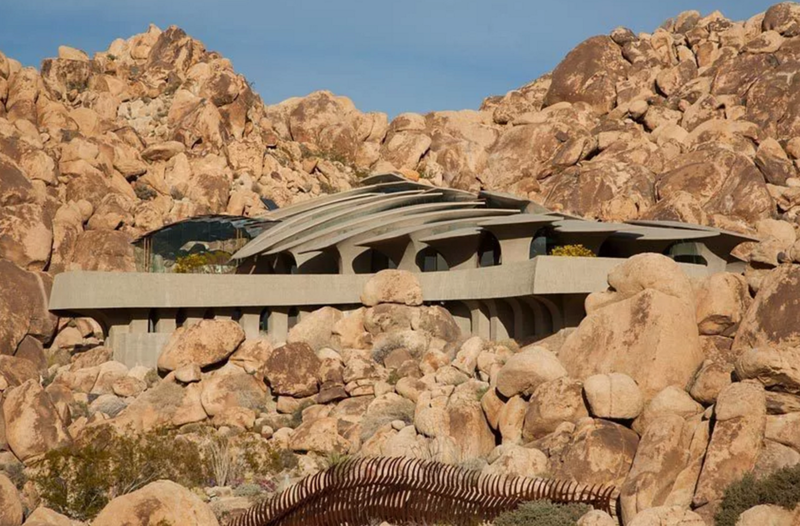 To note, it's around 30min from Joshua Tree in Desert Hot Springs, but like I said, Lautner, Compound.